for a cappella choir (cond.) [9'21"] U.E. (fl. / 2 cl. / bsn. / tp. / trb. / 2 perc. / piano / elec. harpsichord / strings) [19'26"] U.E. for a cappella choir (cond.) [4'05"] U.E. for violin and piano [10'32"] U.E. for oboe, bass clarinet, piano, 3 percussionists (cond.) (4 micr., 2 x 2 loudsp., mixing console / sound proj.) [11'29"] U.E..
for orchestra (28 players / cond.) (3 ob. / 3 cl. / 3 bsn. / 3 hn. / 6 vl. / 3 vc. / 3 db. / vibr. / celesta / piano / harp) [12'57"] U.E. (2-track tape rec., 2 x 2 loudsp., mixing console / sound proj.) [3'15"] St.
for orchestra (cond.) [16'01"] U.E. (2 micr., 2 x 2 loudsp., mixing console / sound proj.) [15'15"] U.E. 4 micr. for doubles basses, 2 x 2 loudsp., mixing console / sound proj.) [ca. 27' ] U.E. (fl. / cl. / bass cl. / bsn. / tp. / trb. / piano / harp / vl. / vc.) [14'13"] U.E. 12–15 7 1952 No. 2 KLAVIERSTÜCKE I–IV (PIANO PIECES I–IV) [ca. 8'] U.E. (2-track tape rec., 2 x 2 loudsp., mixing console / sound proj.) [9'42"] St.
(2-track tape rec., 2 x 2 loudsp., mixing console / sound proj.) [3'20"] St.
(IX and X were finished in 1961) [ca. 73'] U.E. (fl. / ob. / Engl. hn. / cl. / bsn.) [14'47"] U.E. (microphone amplification: piano, guitar / sound proj.) [24'25"] U.E. 26 10 1956 No. 7 KLAVIERSTÜCK XI (PIANO PIECE XI) [ca. 14'] U.E. (4-track tape rec., 4 x 2 loudsp., mixing console / sound proj.) [13'14"] St.
(4 micr., 2 x 2 loudsp., mixing console / sound proj.) [ca. 12' or ca. 15'] U.E. 4 x 2 loudsp., mixing console / sound proj.) [ca. 36'] U.E. (8 micr., 2 x 2 loudsp., mixing console / sound proj.) [circa 12' ]U.E. mixing console / sound proj.) [ca. 61' ] St.
(4-track tape rec., 4 x 2 loudsp., mixing console / sound proj.) [35'30"] St.
2 monitor loudsp., mixing console / sound proj.) [35'30"] St.
Musical Theatre with KONTAKTE [ca. 90'] St.
(5 transmitters, 5 loudsp., mixing console / sound proj.) [113’] St. In addition to the original score, which comprises 30 individual Moments and 71 Inserts, a second score entitled MOMENTE - Europe Version 1972 in which all Moments and Inserts are ordered consecutively is published by the Stockhausen-Verlag. (5 transmitters, 5 loudsp., mixing console / sound proj.) [113'] St.
to 69 ...for love is stonger than death. (4 transmitters, 5 loudsp., mixing console / sound proj.) [26'50"] St.
(5 transmitters, 5 loudsp., mixing console / sound proj.) [14'06" + 6'14"] St.
(4 transmitters, 5 loudsp., mixing console / sound proj.) [11'09"] St.
(5 transmitters, 5 loudsp., mixing console / sound proj.) [25'32"] St.
(4 transmitters, 5 loudsp., mixing console / sound proj.) [7'15"] St.
(5 transmitters, 5 loudsp., mixing console / sound proj.) [13'52"] St.
2 x 7 pages for realisation [duration undefined] U.E. (4 x 2 loudsp.) [ca. 28'] U.E. equipment as in Work No. 16½ MIXTURE for small orchestra) [ca. 27'] U.E. 27 micr., 11 loudsp., mixing console / sound proj.) [27'] U.E. (instrumentation and sound equipment as in Work No. 16½ ) [27'] St.
(2-track tape rec., 4 x 3 micr., 2 x 2 loudsp., mixing console / sound proj.) [ca. 15'] U.E. the rest of the equipment as in STOP "Paris Version") [ca. 20'] U.E. VI fl. / elec. bsn. / hn. (19 micr., 2 x 2 loudsp., 5 monitor loudsp., mixing console / sound proj.) [20'36"] U.E. VI Synthesizer 6 (or percussion) and flute. (perhaps 9 micr., 2 x 2 loudsp., 6 monitor loudsp., mixing console / sound proj.) [21'30"] St.
4 x 2 loudsp., mixing console / sound proj.) [10½' oder 12¾' oder 15½' oder 17'oder 20'] U.E. 5 x 2 or 4 x 2 loudsp., mixing console / sound proj.) [17'30"] score U.E. tape St.
54 22 1966 No. 21 ADIEU for woodwind quintet (cond.) [16'13"] U.E. (4-track tape rec., 4 x 2 loudsp., mixing console / sound proj.) [114' ] St.
by the soloists, mixing console / sound proj.) [ca. 126' ] St.
(4-track tape rec., 28 micr., 12 loudsp., mixing console / sound proj.) [ca. 42' ] St.
(4 micr., 4 x 2 loudsp., mixing console / sound proj.) [ca. 37' ] U.E. (sound equipment as in STIMMUNG "Paris Version") [ca. 70' ] U.E. 60 1968 No. 24½ STIMMUNG (TUNING) "Paris Version"
(6 micr., 6 loudsp., mixing console / sound proj.) [ca. 70' ] U.E. (4 short-wave receivers, 5 micr., 4 x 2 loudsp., mixing console / sound proj.) [ca. 55' ] U.E. May be performed only by a special ensemble; all works without conductor; all with electroacoustic equipment. Durations variable. Existent 7 CD edition: circa 7 hours. (3 micr., 2 x 2 loudsp., mixing console / sound proj.) [integral ca. 135', sections 15'–25'] U.E. bass clarinet, viola, piano [2'32"] U.E. for 4 orchestra groups (4 cond.) [ca. 5 Stunden] U.E. 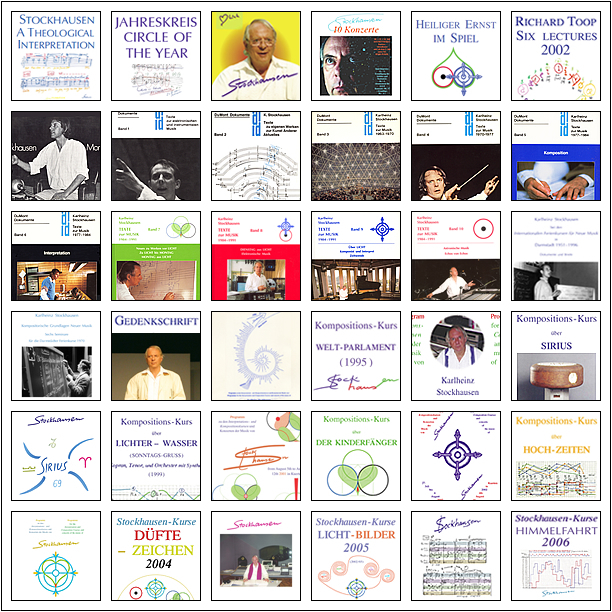 All of the following works are published by the Stockhausen-Verlag. May be performed only by a special ensemble; all works without conductor; all with electroacoustic equipment. Durations variable. for basset-horn, flute / electronic music ad lib. (for example, as an interval signal on tape) [5 x 22"
ENGEL-PROZESSIONEN (ANGEL PROCESSIONS) [51' + 40' ] . 2nd day LICHT-BILDER (LIGHT PICTURES) (intermission) DÜFTE – ZEICHEN (SCENTS – SIGNS) [ca. 40' + 57' ] . (8 transmitters, 2 x 2 loudsp., mixing console / sound proj. Since 1991, a complete edition of all recordings in which Karlheinz Stockhausen has personally participated is being re leased on compact disc. Each CD in this se ries is iden ti fied by Stockhausen's sig na ture fol lowed by an en cir cled num ber. The num bers in di cate the gen er al his tor i cal order of the works. Stockhausen real ised the electronic music and par tic i pat ed in these record ings as con duc tor, per form er, sound pro jection ist, and musi cal direc tor. He per son al ly mixed down the record ings, mas tered them for CDs, wrote the texts and drew the cov ers. The compact discs, a free catalogue and work list may be ordered by mail or e-mail order from the Stockhausen-Verlag (Kettenberg 15, 51515 Kürten, Deutschland; Fax: + 49 2268-1813; www.stockhausen-verlag.com / stockhausen- verlag@stockhausen.org). Stockhausen moderates the world première in English. 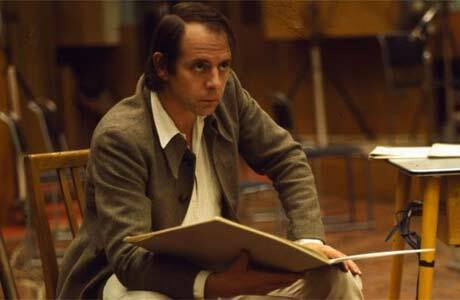 Stockhausen explains the sound playback in English and German. vibraphone with 3 cowbells and glockenspiel, sound projectionist. In January 2007 the Stockhausen-Verlag released the first Text-CD of a new series: lectures which Stockhausen has given since 1952. The edition is limited to 300 copies per release. He spoke these lectures in German. Most of them are supplemented with musical examples. English translations of the texts may be ordered from the Stockhausen-Verlag. 2 KURZWELLEN / SHORT WAVES at the spherical auditorium in Osaka. 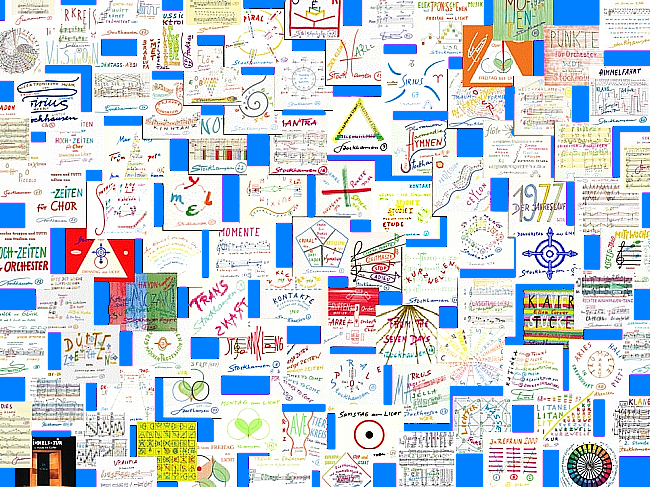 4-colour prints may be purchased from the Stockhausen-Verlag. Vol. 5 / Vol. 6: Texts about Music 1977–1984. Vol. 10: Astronic Music – Echos of Echos. Mya Tannenbaum: Stockhausen, Intervista sul genio musicale (in Italian, Laterza & Figli, Bari, 1985). Karl H. Wörner: Karlheinz Stockhausen, Werk + Wollen (in German, Musikverlag P. J. Tonger, Rodenkirchen, 1963; English edition [translated by Bill Hopkins], Faber + Faber, London, 1973). In 1974, Stockhausen composed the 12 melodies of the star signs for music boxes and produced them in collaboration with technicians at the Reuge music box factory in Ste. Croix, Switzerland. In 1989 the Reuge family sold the company, and the production of these music boxes was discontinued. After extended negotiations on the part of Suzanne Stephens, and on the occasion of the composer's 70th birth day, an agreement was reached for the one-time manufacture of a limited edition. Each of these music boxes were checked by Suzanne Stephens and Antonio Pérez Abellán on location at the factory and adjusted there before they were shipped to Kürten. This 70th Birth day Edition is limited to 40 music boxes for each star sign, num bered 1 to 40. They may be ordered directly from the Stockhausen-Verlag. The melodies are encased in light- coloured natural wood boxes measuring 17.7 x 12.1 cm. The notes of the ZODIAC melody – hand-written and signed by the composer - are silk-screened onto the lid of each music box. Abbreviations and the addresses of the film producers are listed on page 67. This is a list of several recommended films. 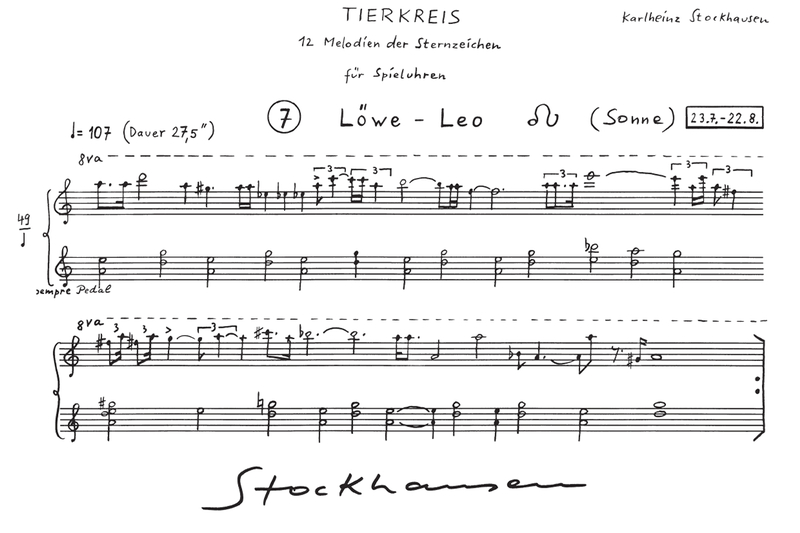 A comprehensive list of films (made until 1998) about Stockhausen's work is printed in TEXTS about MUSIC Volume 10 (pp. 821–843). The addresses of the producers or distributors are listed at the end. 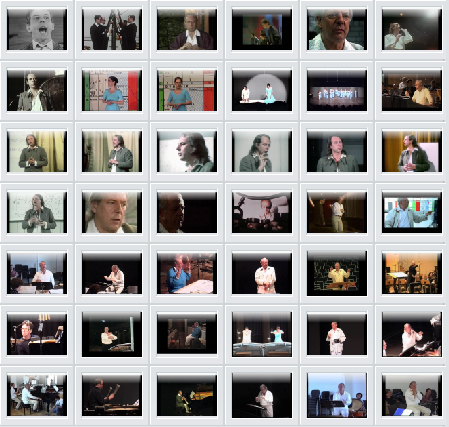 Copies of most of the films are in the archives of the Stockhausen Foundation for Music. French 35 mm,16 mm and BetaSP 27'12"
German 16 mm and U-Matic 49'16"
German 16 mm and U-Matic 30'44"
English, French, German, Spanish, Arabic 16 mm 56'23"
German 16 mm and BetaSP 58'43"
German MAZ and U-Matic 82'30"
2The same version as film no. 22, but supplemented with excerpts of VORTRAG ÜBER HU (LECTURE ON HU)..
German MAZ and U-Matic 44'27"